What a "Gamut" is, as in "Run the Gamut"
Simon E. asks: I was just wondering what a gamut is in the expression “run the gamut”? Meaning “the entire range,” the word gamut traces its origins to the Middle Ages and a system for designating musical notes. Around the turn of the second millennium, Guido of Arezzo, a medieval monk, developed a system of solmization, i.e., designating musical notes by syllable names. While today, we are familiar with the sung syllables, do, re, mi, fa, sol, la, ti, do, back in Guido’s time (he died in 1050), they had a hexatonic scale (six notes), and he used the syllables ut, re, mi, fa, sol and la. The ut represented the lowest tone recognized in music theory at that time, the second G below middle C, which was also known as gamma (today, this note remains as the lowest line of the base clef). Guido chose ut from the hymn Ut Queant Laxis Resonare, sung in honor of St. John the Baptist and attributed to Paulus Diaconus (720-799 AD). By contracting together the name of the note with its sung syllable, Guido coined the word gamut, which he used to identify his system of solmization. Building on this denotation, gamut eventually came to mean “the whole musical scale” in the 1620s and a “range of notes of a voice or instrument” by the 1630s. It is to this time, and these meanings, that the denotation of “an entire range” is attributed, although it isn’t clear when the expression run the gamut first appeared. What’s a “Gander” and Why Would You Want to Take One? Use of the word, spectrum, to denote an entire range is relatively recent, and traces back only to 1936. Of Latin origins, spectrum originally meant an apparition or specter (from the word, specere, meaning to look at). The denotation of the “visible band showing successive colors” when light passes through a prism was first seen in the 1670s. Range has meant scope or extent since the late 1400s, although it was first seen in English about 1200 AD, when it originally meant a “row or line of persons.” Other meanings have included a cooking apparatus (mid-1400s), the distance a gun can shoot a bullet (1590s), the area where animals, and particularly grazing animals, seek food (1620s), a line of mountains (1705), a collection of townships (1785), and a place to practice shooting (1862). Extent is an English-French word that dates back to the early 1300s and originally meant both the area of a piece of land, as well as its value. The denotation of the reach to which something extends dates from the 1590s. As a synonym for gamut, scope has been in use since the 1530s. Its origins are said to be Italian, from scopo, which meant the “aim, purpose, object, thing aimed at, mark, target,” and the Latin scopus. The denotation of the extent of a view was first recorded about 1600, while as a verb meaning to view, this only appeared in the early 1800s. As an instrument used for viewing, this meaning only came about in the late 1800s and is believed to have been taken from words like telescope and microscope. The word field has been used to describe an entire collection of related things since the mid-1300s and is attributed to the Old English (500-1150 AD) word, feld, which originally meant a piece of cultivated, pasture or open land (but distinct from a wooded area). Its other meanings include a marked off parcel of land (also Old English), a battle ground (1300), those participating in a sport (1742), a place from which something is extracted (1859), the place where a game is played (1875) and to play the field (1936). Panorama, meaning a “comprehensive survey,” traces its usage to the early 1800s, while its other denotations, such as a complete view and as a type of painting, predate it by a few years. The artist Robert Barker coined the word in 1789. 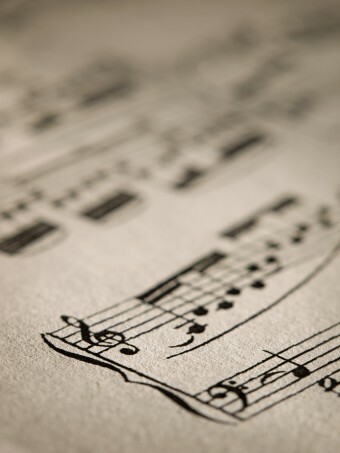 Clef was originally a Middle French word of the same spelling that first appeared in the 1100s and meant a key. It was first seen in English in the 1570s, by which time it meant the symbol on a musical staff to denote its identity and pitch. The modern symbols for the treble and bass clefs are simply evolved versions of the letters G and F, respectively (denoting that the former is also the G-clef, and the latter, the F-clef). Why are Notes of the Tonal Scale Called “Do, Re, Mi”?